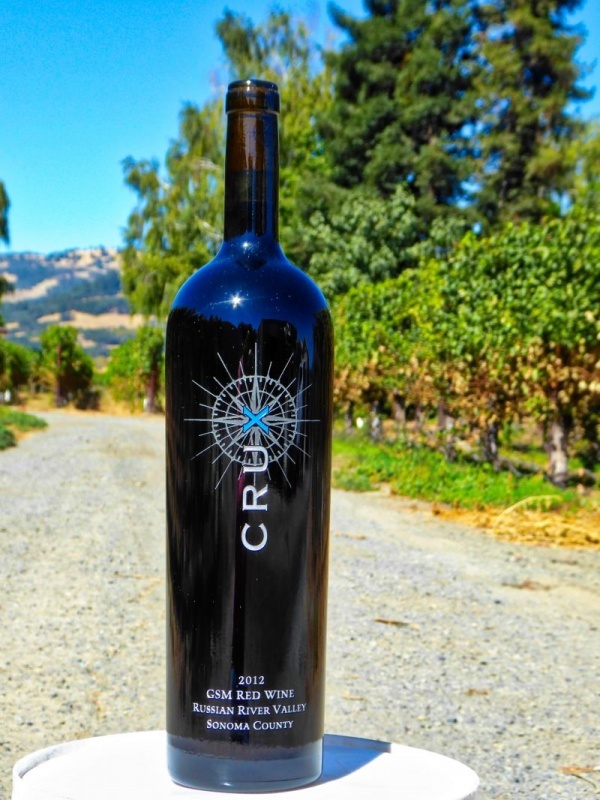 Crux Winery is the antithesis of the tourist-focused large wineries on Highway 29 in Napa Valley. 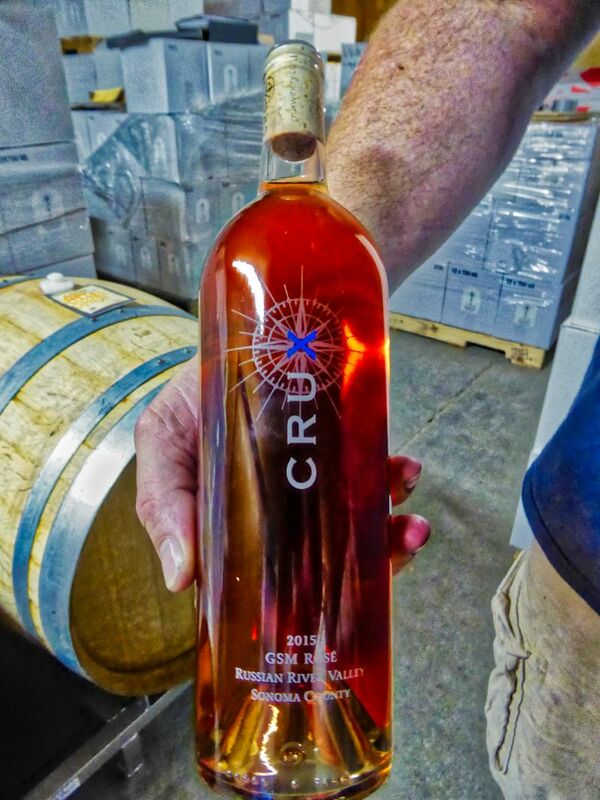 Crux Winery is two guys in a warehouse making wine. That warehouse is one of a cluster at the end of a narrow road; if you want a picture to illustrate “the middle of nowhere”, you could do worse than use this building. The tasting room is just a corner of said warehouse surrounded by barrels and equipment. The bar is a plank of wood placed across two barrels. California Girl and I found this place on the recommendation of a couple of friends Stacy Briscoe and Dave Razzari; you are not going to see it by driving past. Even when we followed our GPS to the site, it took some wandering to locate the winery. We were greeted by Steve and Brian, the aforementioned two guys, who run all aspects of the business. When we arrived, they were working with the press, extracting the last of the juice from a load of the 2017 harvest. Tastings are by appointment only, so we were expected and the wine we were to taste had been poured into small carafes. They use a Coravin to extract the wine into these carafes, which avoids the need to open bottles for a tasting; saving wine. 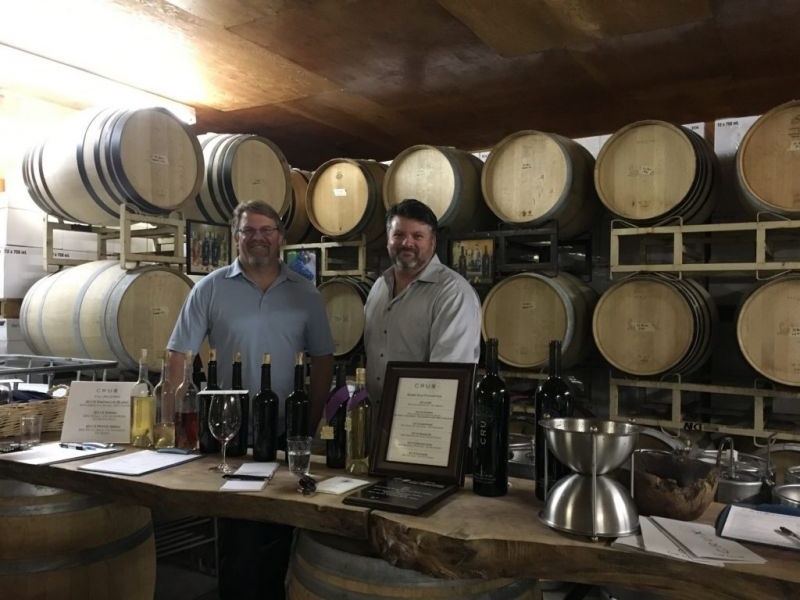 Brian and Steve both grow grapes at their homes in the Russia River AVA near Windsor, buying additional grapes from other local sources as needed. 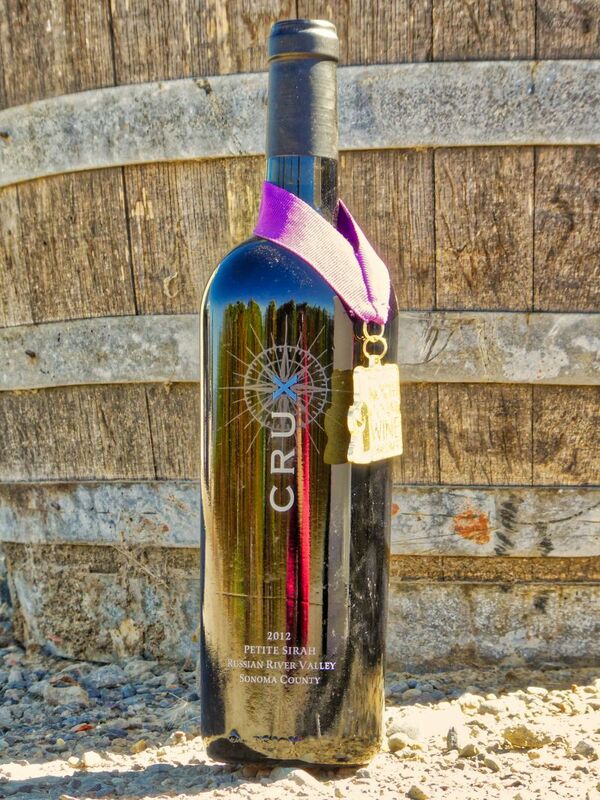 The Crux brand came into existence in 2012, but they had been making wine in their garages for ten years before that. All aspects of the operation are handled by the two guys, from harvesting, through crushing, to hand bottling. The focus of Crux winery is on making Rhône style wines. Thus most, but not all, of the wines, were made from Grenache, Syrah, and Mourvèdre. The name derives from the home vineyards of Brain and Steve lying at the meeting point of several AVAs. 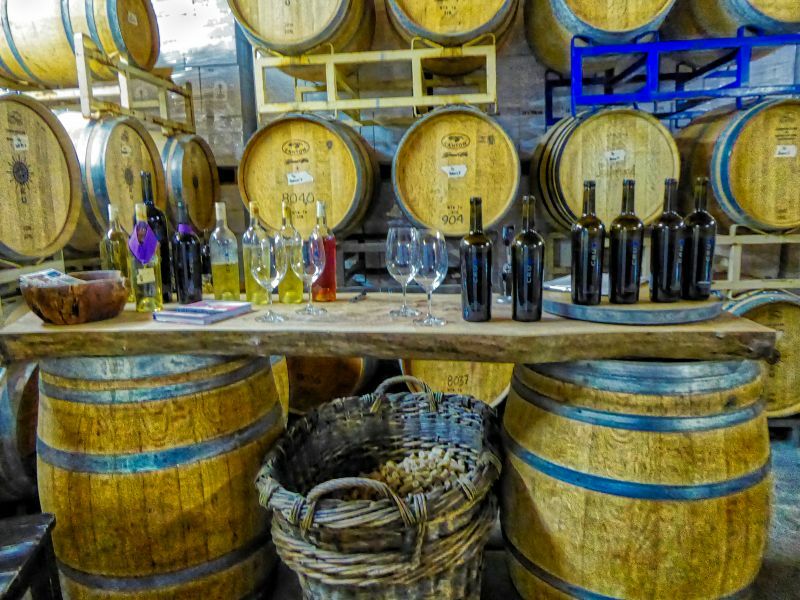 As you may have gathered from my description, Crux is not a volume producer; they make eight to ten different wines a year, but their total production averages just one thousand cases a year. We started our tasting with the 2015 Grenache Blanc ($28). The nose was of apricot and white pepper. The wine had low acidity, with a dry mouthfeel that was heavy on the minerality, backed up by notes of green apple and a hint of butter in the finish. We stayed with white wine for our second taste: the 2014 vintage SBV ($26), a blend of Sauvignon Blanc and Viognier. This is a mix that we had not previously encountered. The nose was classic sauvignon blanc cat pee, but with a backing of peach. Taking a sip I found a balanced wine with crisp acidity, marked minerality, and notes of green apple. The third and final white was the 2014 Viognier ($28). The medium intensity nose was laden with aromas of pear with subtle underlying hits of stone fruits. The medium plus acidity was a subtle, yet complex blend of lemon and apple. A clean wine that is an ideal patio sipper. The favourite of the three whites, but none of these white wines were noteworthy. Before we moved onto red wine, we tasted the 2015 GSM Rosé. This is a 50%,32%.18% blend of the three grapes (Grenache, Syrah, Mourvèdre). Slightly darker than a typical rosé, the wine was somewhere between orange in salmon in hue. The low-intensity nose had vague aromas of strawberry. Good acidity balanced a tantalising mix of watermelon and orange rind that led to a long finish; far more French than Californian in style. We then had a three-year vertical tasting of the Crux Grenache, which involved sampling the 2012, 2013, and 2014 vintages. The 2012 had an intense nose dominated by mint. This unusual element of a wine bouquet reflects the mint that grows in the vineyard from which these grapes were harvested. The flavour was of cherry, mint, pepper, and chalk; this complex and unusual combination of tastes led to a long finish. The 2013 shared the mint aromas but demonstrated a different flavour profile. There was an initial blast of acidity, punchy tannins, and some fruit on the finish. It was an enjoyable drink, but not as good as the previous year. Our trio of Grenache samples concluded with the 2014. The garnet hued wine once more offered aromas of mint, this time strengthened by redcurrant. Taking a sip, I found less prominent acidity and a long fruit forward finish of redcurrant. The 2014 was the best of these three, all of which showed pleasing individuality. Our next taste was the 2014 GSM ($42). The medium intensity nose was a challenging mix of paraffin and blackberry. The emotional response to this aroma was far more positive than the adjectives imply. Redcurrant mixed with cigar smoke and mint made for a vibrant, drinkable, and well-structured glass of wine. This was my favourite so far but was not to remain on the top of the pedestal for long. Next up was the first, and so far only, vintage of Mourvèdre from 2014. The nose was intense and reminded me of childhood harvesting blackberries from common land in Southwold. There was medium plus acidity, with zesty tannins, and a deep fruit finish with plum and blackcurrant in prominent roles. Mourvèdre is hard to ripen, thus making a wine with this as the main variety is challenging. Conditions in 2014 provided Steve and Brian with a rare opportunity to create a wine from this grape. We then sampled the 2013 Russian River Syrah ($38). It greeted me with aromas of plum and blackberry; a wonderful invitation to taste. I found flavours of plum, cocoa, and leather, all wrapped in moderate to intense tannins that combined to provide a delightful finish with a sweetness that was not apparent in the initial flavour. The 2014 Zinfandel ($34) was our next taste. It contained 4% Petite Sirah. The nose was of leather and ripe cherry. Surprisingly light in the mouth without a hint of jam, but strong fruit notes of cherry that were swirled with cigar smoke. This is not a Rhône grape, but Crux had still made a wine that felt more European than Californian. We concluded our tasting with the 2014 Petite Sirah ($42). The nose was intense; a veritable assault of cocoa and smoke. The taste was divine; coffee, plum, black tea, and dark fruits. I enjoy Petite Sirah, I have harvested Petite Sirah grapes; so I admit to a bias to this varietal, but this was a stunning example of the grape at its aggressive and complex best. I found all of the Crux red wines interesting and worth drinking, but this was the star of the show. If you were to come across a Crux bottle in a restaurant, you would not think it was a wine made by two chaps in a large shed. Taste the contents and you will encounter wine made with a definite individual flair. If you want a big Napa Cab, oaked Chardonnay, or jammy Zin then Crux is not for you. If you want wines that remind you of a café in France, without the Gauloises smoke, then it is worth seeking out Crux wine. Thank you so much for seeking us out and for the informative write-up. Hopefully we can do it again soon. We would welcome visits from your readers and would be pleased to offer a complimentary tasting to anyone who mentions your site. Cheers to great wine experiences! Hi Brian, we loved hanging out with you guys. I am sorry our article took so long, but like everyone, we were a bit flattened with the fire and we were traveling out of the country. Thank you for your hospitality. Cheers to a Happy Holidays and a great New Year! What a fantastic article! I don’t think I’ve ever tried this wine, I’ll have to look out for it!